During the Counter-Reformation in the year 1573, a Jesuit college and library were founded in Graz. Seven years later the old college was transformed into a university, and the considerable collection of books became the University Library of Graz. The Jesuits were in charge of the library until 1773, when the dissolution of their order put an end to the Bibliotheca Collegii Societatis Jesu Graecii. Unfortunately, this catalog has not survived, and there can be no precise estimate of the scale of the Jesuit library. In 1775 the administration of the library was taken over by the state. A university archive was established in 1778. The emperor Joseph II transformed the University of Graz (along with many other universities within his territory) into a lyceum in 1782, thereby reducing the official status of the library. Nonetheless, the collection grew enormously over the following years. Since 1807 the library has held the right to collect legal deposit copies of every book published in Styria. 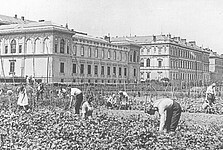 On 19 April 1827 Franz II reestablished the old university rights and gave the institution its final name of Universitas Carolo-Franciscea (Karl-Franzens University). 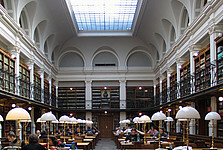 In 1828 the library contained 37,000 volumes. In 1894, after the library reached more than 135,000 volumes, it had to be moved into a new building on the university campus in the east end of the city, where it remains today. The decline in the growth and management of the library that started during World War I accelerated in the following decades. It was only in the late 1940S that acquisitions increased. The library also took a step forward in 1921 by employing two female academics. Between 1938 and 1945 the library was temporarily subjected to National Socialist principles of administration. As a result of World War ll, the university library suffered considerable losses. The size of the staff was reduced to such an extent that administration of the library became exceedingly difficult. In the autumn of 1944, 60,000 volumes were evacuated from Graz to four different places in Styria to avoid air raids on the city. When the library was reopened on 22 October 1945, 4,500 volumes, among them 200 manuscripts, had been plundered. In 1970 the original library building was enlarged. 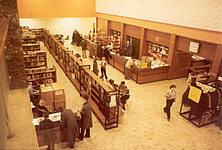 In 1991 additional branch libraries were established e.g. 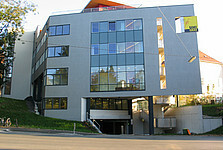 Mathematics, English/American studies and Geography in Heinrichstraße 36. 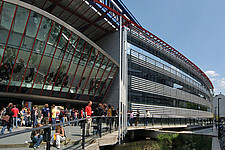 In addition to the central library unit in the main building of Karl-Franzens University, there is a large language and linguistics library center (Wall building) and a specialized library for law and social sciences (ReSo Wi Building), which was designed by the famous Austrian architects Domenig and Eisenköck. A special media department offers audio and video materials on a variety of subjects and in various languages as well as the necessary playback facilities. From 1994 to 1996 a catalogue room for online searches and a new administrative area were added to the main library, forming a structure that connects the main building with the ReSoWi. 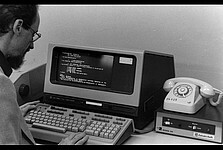 With the start of the new millennium the library increasingly invested in electronic resources and the necessary technical equipment. Since 2011 the new search portal unikat offers the latest in information retrieval for researchers, lecturers and students.